Jason Dodge’s sculptural practice adjusts our material world to build moments of narrative, connection, and potentiality through the lens of natural phenomena. The collections of objects involved in Dodge’s practice do not so much stun the viewer into misunderstanding, but instead entice the viewer to engage in a limitless unraveling—what the artist calls the “inward spirals,” or “vortexes in singular things.” Since his first solo exhibition at Casey Kaplan in 1998, Dodge has brought attention back to the alchemical process of things, bringing a mystic contemplation to the otherwise banal and overlooked. In conjunction with his upcoming exhibition at the Neubauer Collegium for Culture and Society at the University of Chicago, Ryan Filchak and Dodge discussed the artist’s methods toward exhibition design, his collaborations with poets, and working with curator Dieter Roelstraete. Ryan Filchak: In the past, you have cited a continual pursuit of new working methods for your exhibitions. How do you feel your approach towards your recent exhibition at Casey Kaplan, Jason Dodge: hand in hand with the handless, reinvents your thinking process towards the presentation of your work? Jason Dodge: In my last several exhibitions, I thought about how much to touch something and how much not to—being a part of what we are doing as people moving around in the world, participating, and trying to understand, isolating some of the things that fall from us while we are living and trying to lend then force in rooms. I guess it is always evolving. 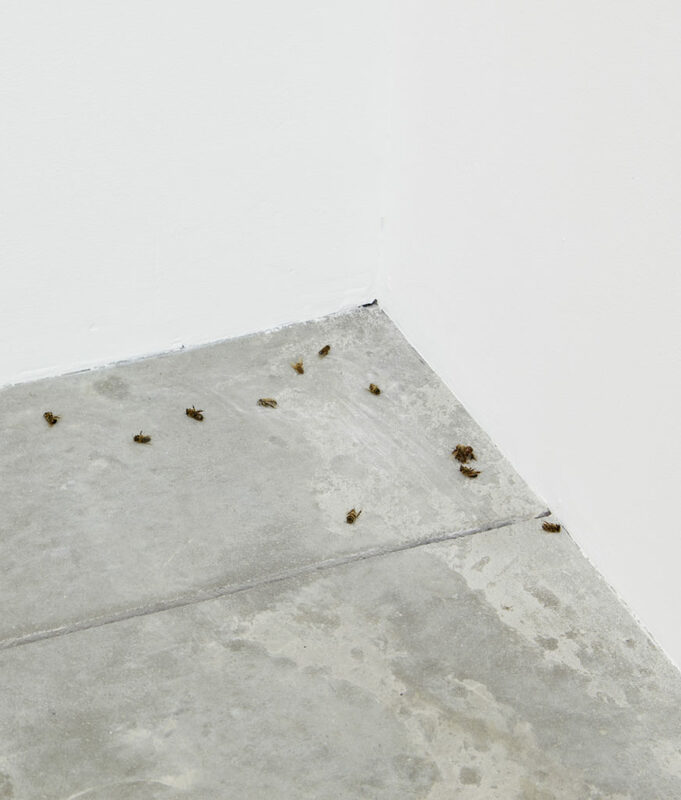 Jason Dodge, installation view at Franco Noero, Turin. Courtesy of the artist, Franco Noero, and Neubauer Collegium. RF: The subjects you address in your work, regardless of how you much you as the artist may touch them, trace the infinitely complex possibilities of how objects change over time, and travel through space. Do you care to elaborate on the process of this selection, and why these themes of connection remain a high priority for you? JD: I like how we (people) use things while we are alive—things made from the same atoms [as us], things that take up space and are our mirrors (cell phones, cars) and our embarrassment (islands of plastic in the Pacific, guns). We pass things, like jewels, on through our families and discard an unused packet of soy sauce after a takeaway meal. Things in the world are like words, they come as they are, and can be infinitely reimagined and ordered in ways that open new worlds and to reflect on our own. The same words can exist in a diary or a political speech, and I see the sculptural manipulation of those words as a platform where their meanings meet their possibilities. RF: It is interesting you bring up the mutability of language. The title for hand in hand with the handless comes from the 2011 poem “Recurring Awakening” by Franz Wright, and although the works in the gallery contain neither titles nor text, poetry does play a key role in your practice. You treat everyday objects in the same way a writer or poet shapes words at their disposal. Do you find solace in this approach to endless possibility, or do your attempts to attach meaning to the limitless reality of personal experience overwhelm you? JD: That is a nice question. I do not really know how to answer, because I do not feel like I place myself in the role of writer, as the object of personal experience, or as messenger of meaning. The question of where I exist in relation to the work constantly shifts. I feel most comfortable as a harbinger, or at least operating in real time, something like diving into the present—this is one of the reasons why I do not engage in specific meaning. I see myself engaging with the act of reading more than writing. Perhaps the things I use to make the work are like tools used to read, and that is why they are similar to words, as words are also tools to read. I do not think meaning belongs to me. 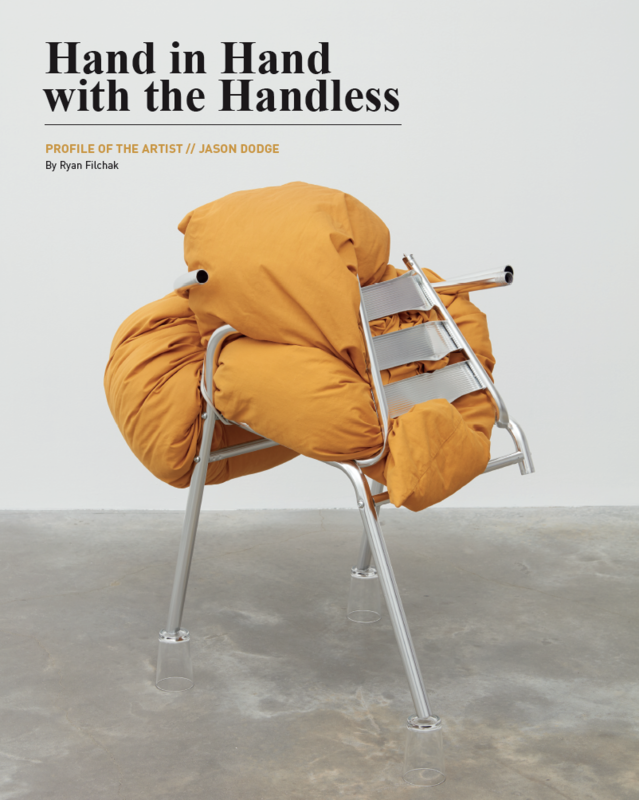 Jason Dodge, installation view of Jason Dodge: hand in hand with the handless, 2018. Courtesy of the artist, Casey Kaplan, and Neubauer Collegium. RF: Recently I read your lecture on sculpture, entitled “Subtractions,” and realized that asking about a potential shift in emotion—between the restful and the sublime—has more to do with the projections of my own reaction to your work. Through the exploration of our material reality, there is a transition that occurs from curiosity, to understanding, to connection. This trajectory works so profoundly within the viewer’s experience. To continue this analogy of reader and writer, for your exhibition at the Neubauer Collegium in Chicago you will be working with curator Dieter Roelstraete. Have you worked with him in the past, and how would you describe a curator’s role in relation to your ideas of exhibition making? JD: Dieter and I have had an ongoing conversation for the past decade at least, and I suspect that the project we will make in Chicago will connect to this. The poet Ishion Hutchinson will also be a part of the show and will be authoring a poem that is read within the exhibition, and is meant as a text for taking away. What is exciting to me about the Neubauer Collegium is that it is not only a chance to experiment, but for that experimentation to be used, debated, and discussed by the students at the University of Chicago. Hutchinson and I also have an intense ongoing conversation about imagination and working in our various ways. Several years ago, I published a volume of his poems, and it seems like a logical extension of our conversations to make something together again in a very different context. RF: This role of publisher reiterates your perceived role as messenger—do you see these secondary interactions as a part of the work, or again, simply the message you intend to carry? JD: The publishing comes from a place that one person’s work, i.e. myself, is not enough. I wanted to find a way to work with poets in a way that involved making something together, and in the case of fivehundred places, it is to make books of their poems. The books function as an attempt to introduce poetry in a way that anyone reading those poets can read them for themselves as opposed to through me. In the last years, I have limited what comes into my work, and essential to that is including other voices, not on my terms. In the case of Hutchinson’s work for the Neubauer, I asked him to write a poem for the exhibition that will be taken away— meaning that its frame begins with my work and ends without it. I also mentioned to him that the title of the poem would also be the title of the show, and that I would take no influence over that. 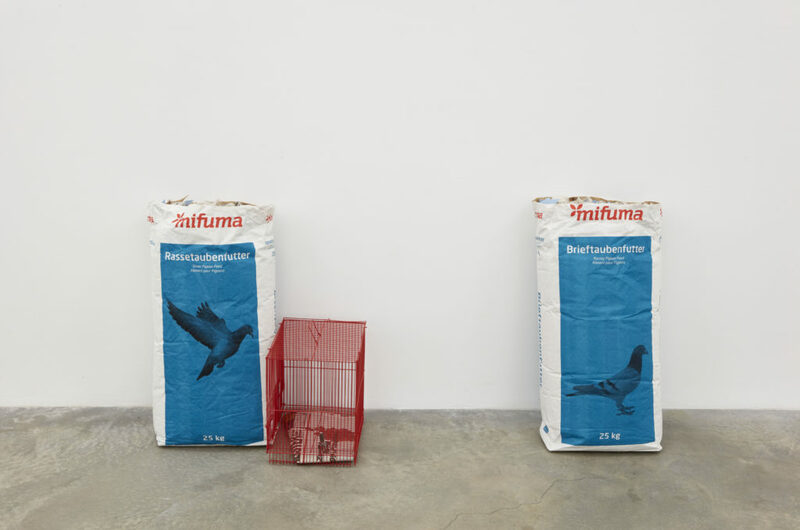 Jason Dodge, installation view of Jason Dodge: hand in hand with the handless, 2018. Courtesy of the artist, Casey Kaplan, and Neubauer Collegium. RF: Have you always sourced your titles from other poets? JD: I have been trying to eliminate language from my work for a long time, step by step. Now I do not use language for my works. For the last two years I have mostly asked poets for titles, but the show at Kaplan this year was the line from Wright that I love so much. RF: After speaking about this collaboration with poetry, I am now thinking about both Hand in Hand with the Handless and your ongoing installation A Permanently Open Window. 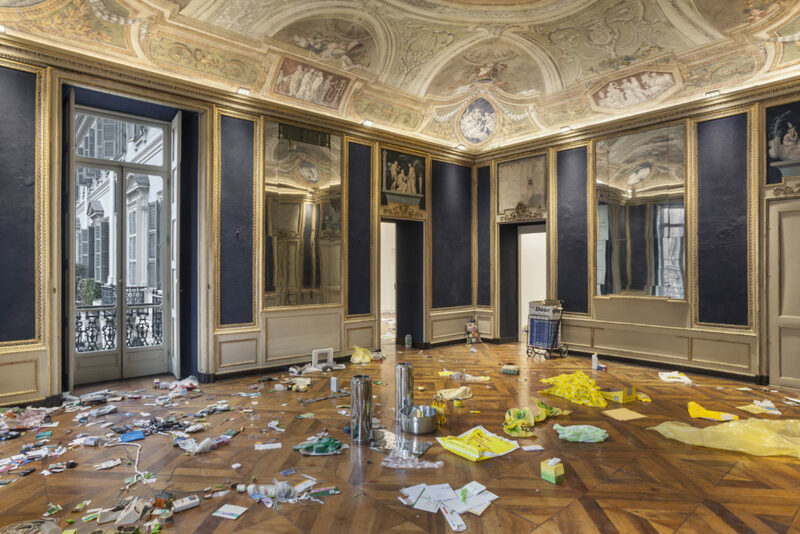 Where one is a collection of material objects in a gallery, and the other is a manipulation of withstanding architecture. JD: Yes—I have been thinking a lot about things that barely come in and out of focus, sometimes litter, cheap things, or things with the sort of blankness of utility because they can be tuned to something heartbreaking, destructive, lonely. I am also interested in how slight the touch is, like how a plastic bag might sit around for years, then used once to carry something from one place to another and discarded. There is a lot of potential in the cruelty of the use, and cruelty to the ecology of the planet. I want to explore these emotional notions from as close as possible. In Chicago, I have planned very little and am trying to engage with things that same sense—how much to touch something and how little to touch something. Jason Dodge at the Neubauer Collegium for Culture and Society at the University of Chicago runs through December 21, 2018. Jason Dodge (b. 1969, Newton PA) is a conceptual artist who lives and works in Berlin. He completed the Independent Study, in association with Maryland Institute, Malawai Africa (1990), the Independent Study, Studio Art Centers International, Florence Italy (1991) and earned his MFA from Yale University School of Art, New Haven, CT (1996) and his BFA from Maryland Institute College of Art, Baltimore, MD (1992). Dodge has exhibited widely both domestically and abroad, including exhibitions at Casey Kaplan, New York, Taka Lshii Gallery, Tokyo, Galleria Massimo de Carlo, Milan, Yvon Lambert, Paris, Andersens Contemporary, Copenhagen, Galleria, Franco, Noero, Torino. His work has been added to permanent collections, including Astrup Fearnley Museum of Modern Art, Oslo, Corcoran Gallery of Art, Washington D.C., Moderna Museet, Stockholm, Solomon Guggenheim Museum, New York, NY, Frac des Pays de la Loire, Carquefou, Institut D’art Contemporain Villeurbanne/Rhône-Alpes, Villeurbanne, Israel Museum, Jerusalem. The founder of poetry imprint fivehundred places, Dodge has published 25 monographic books of poems by contemporary poets, including Ishion Hutchinson, Eileen Myles, CAConrad, Dorothea Lasky, and Matthew Dickman. September 26, 2018 | Filed under Art Seen: Chicago and tagged with Dieter Roelstrate, Jason Dodge, Neubauer Collegium, Poetry, Ryan Filchak, University of Chicago.